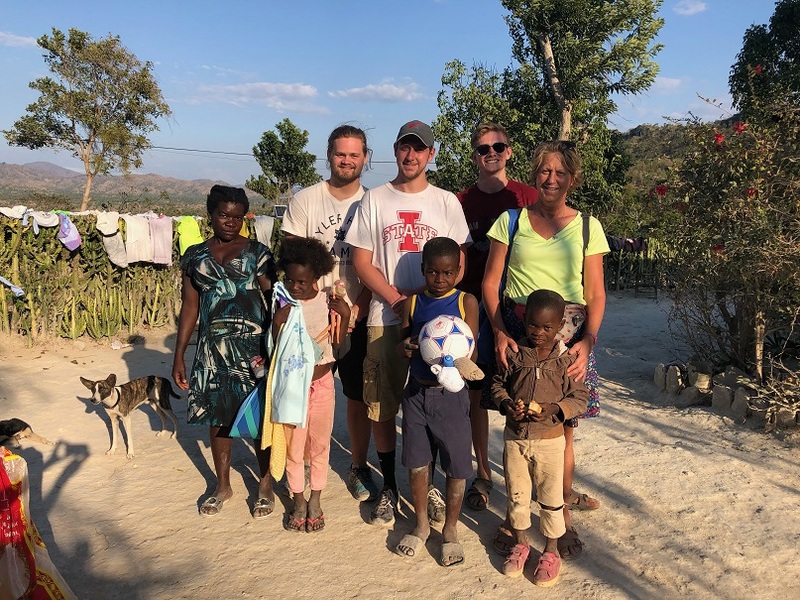 A small team from Iowa State is currently on the ground in Haiti. 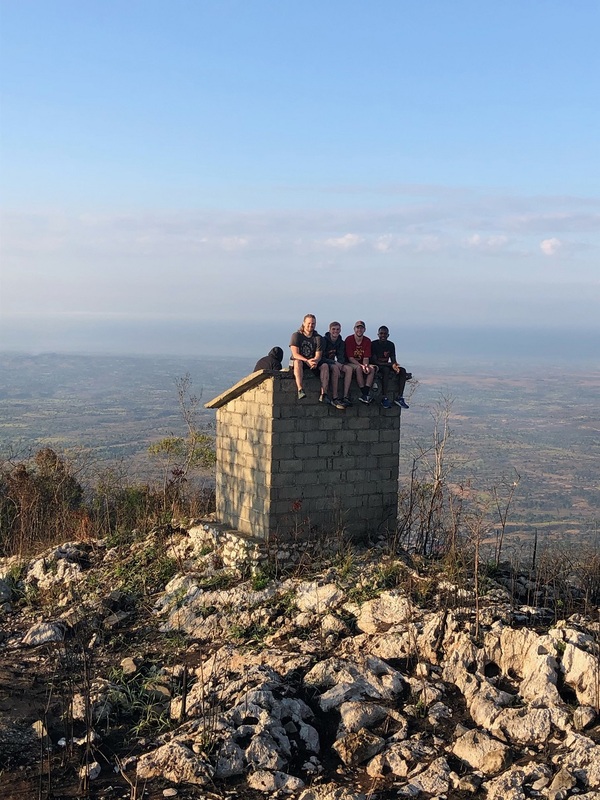 Team leader, Lucia Van Maanen, who has 9 years experience leading teams and serving in Haiti, is giving them a very unique insight into Haiti and it’s people. After three and a half days of being in country, we finally set the priority to write a blog post. During this time we have done a lot. 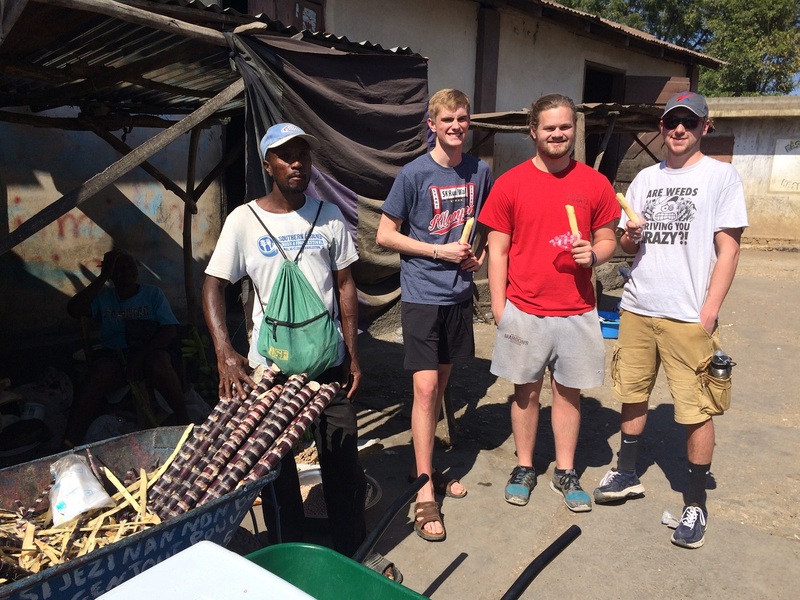 We landed in Pignon around noon on Thursday and went into Pignon and visited the market and surrounding area. 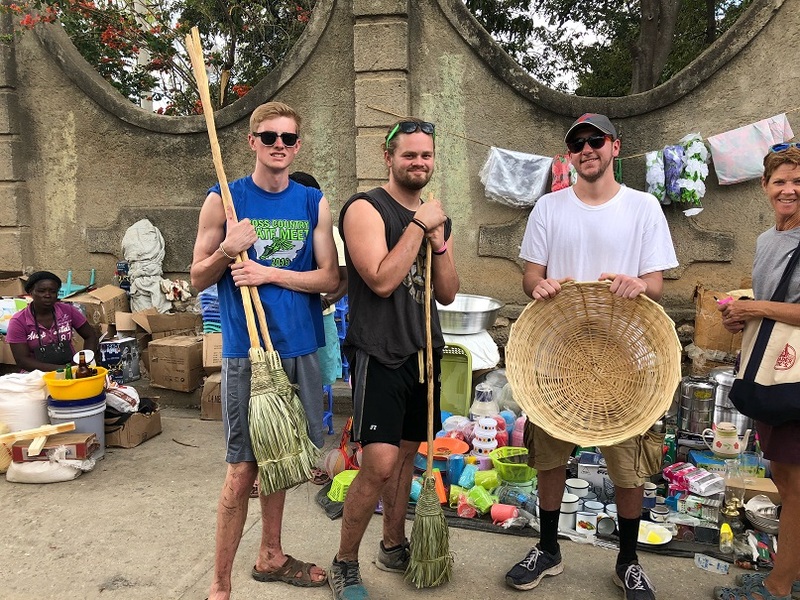 Many Hands for Haiti has a really big impact as it showed as we drove around. 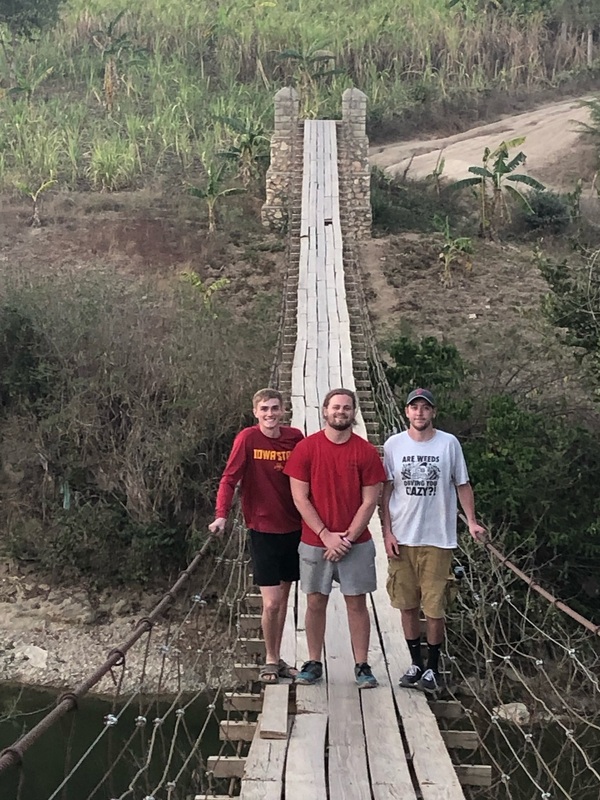 Later in the afternoon, we headed to see a suspension bridge about a mile away from our campus. 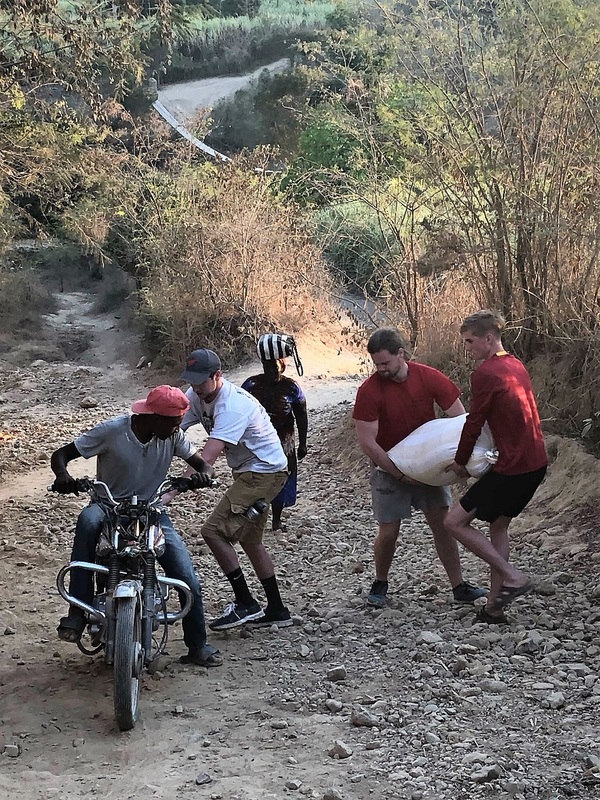 We had the occasion to help push a guy up a hill on his motorcycle because he had what seemed like two-one hundred pound bags of beans on the back and he was not able to make it up without our help. When we were on the bridge Noah was really close to Jack and was making the bridge sway back and forth and Jack was not very fond of that. On the way back to the campus we stopped at one of many rum factories and took a look inside. 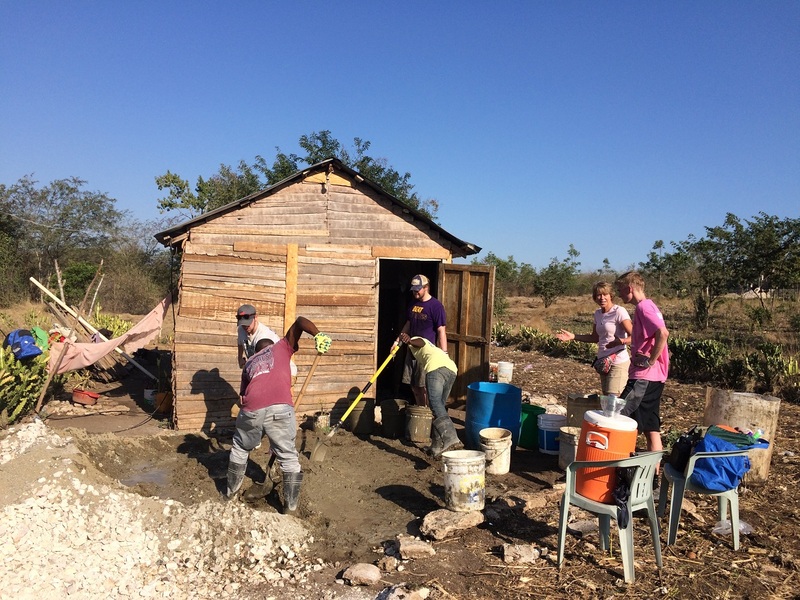 Friday was the first full day and the first thing to do was to help lay down a concrete floor. The family lived in a small one-room house, maybe ten feet by twenty feet max, and still had six people living in it. It was the first time I saw the poverty up close and also saw the importance of something that I take for granted every day, concrete. The majority of people here have dirt floors in the houses and they often get parasites and other sicknesses from sleeping on that floor. 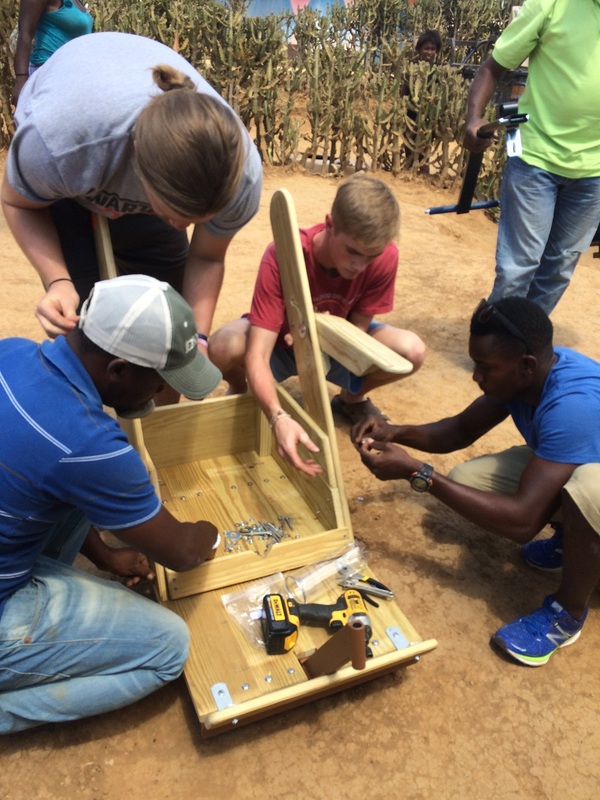 One cool thing about the concrete was that all the materials were made or purchased locally, which is a way for us to help a family and the community at the same time. After we poured the floor we went back to campus and got some P.E.T carts ready to be delivered. P.E.T carts are three wheel carts that are either powered by a hand crank or have a handle that you can pull the cart with. The carts are for people with disabilities and give them the ability to be mobile. Being able to give those people the gift of mobility was an awesome feeling and each of the recipients, along with their family members, were extremely thankful. Saturday was a big day. 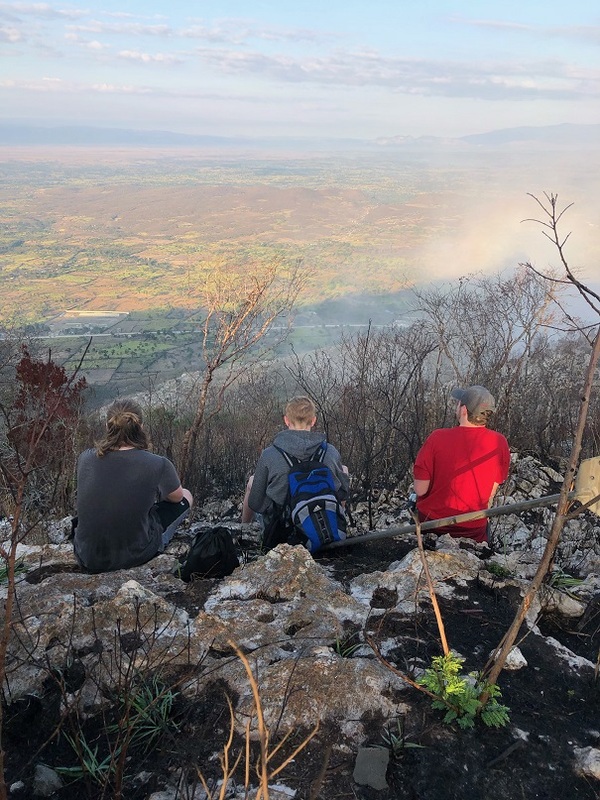 We woke up at 5:00 and set off to climb Mount Pignon. It took Jack, Noah, Herby and I a little less than an hour to climb it and the views at the top were breathtaking. I won’t forget watching the sunrise from the top. On the way down Lucia broke her record for how many times she fell only falling two times besting her previous of four falls! After the mountain, we headed into town to go to the market. We went to the market on Thursday and it was very low-key, not busy at all. Saturday was a completely different story. People come from all around the countryside and the town once a week to sell whatever it is that they have. It was a very hectic time and we had to be sure that we did not get separated. 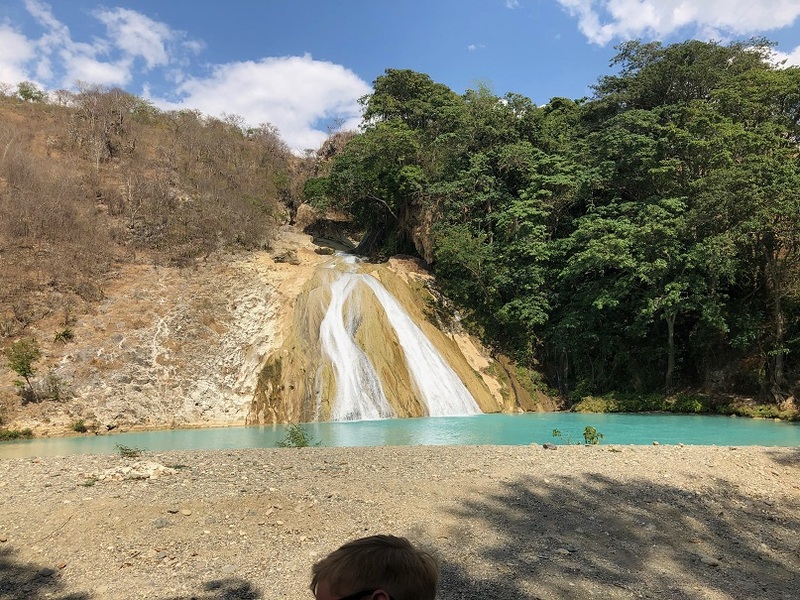 Once we got all the items on our list we went back to campus and set off for a waterfall that was about fifteen miles away, but because of the road conditions and a detour, it took us a little over an hour and a half to get there. 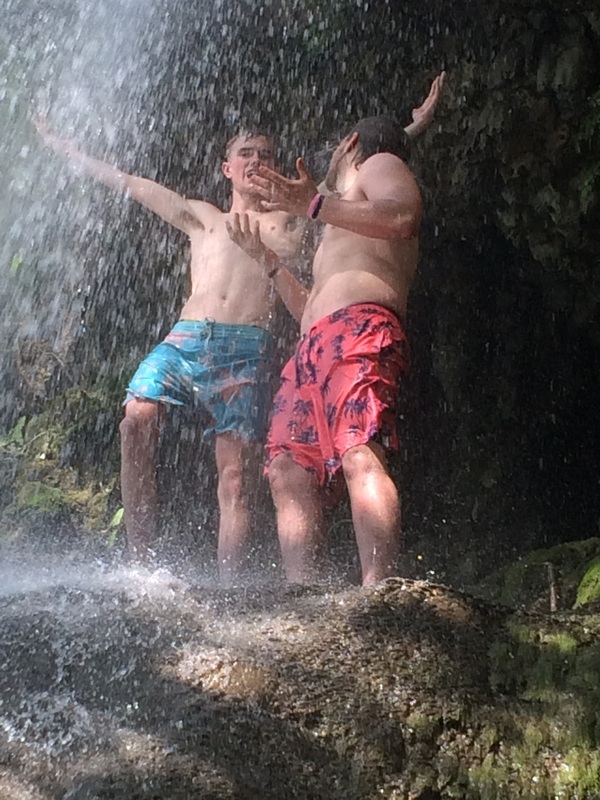 Once we got there the waterfall was from a natural spring and was a beautiful blue color. 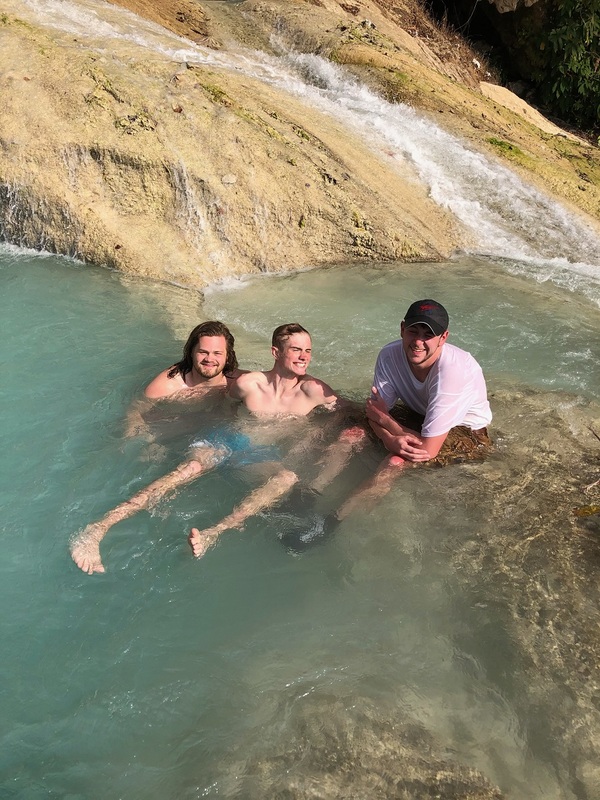 The waterfall flowed into three small basins before it emptied into the main pool at the bottom. 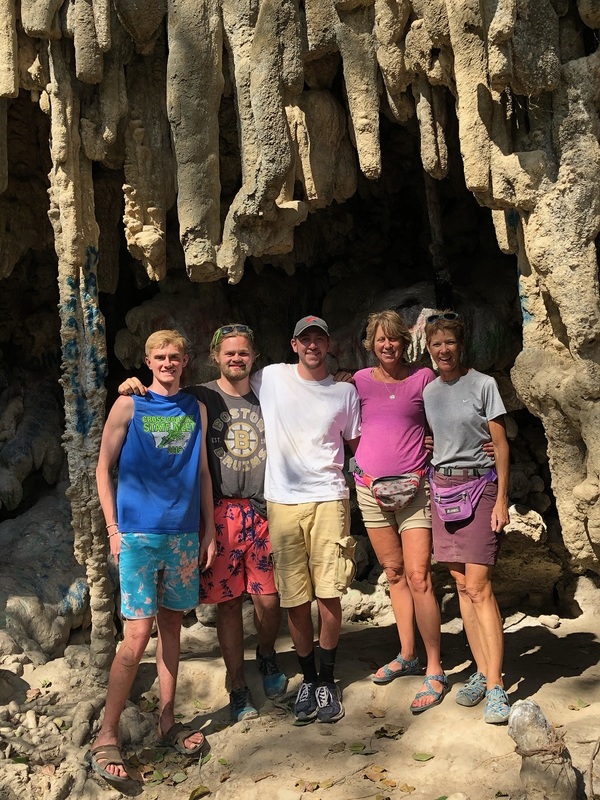 We swam in one of the basins and it was fun to be able to cool off and relax for a little while. Once we left the waterfall and got back to campus we got everything ready for the movie night at our campus. 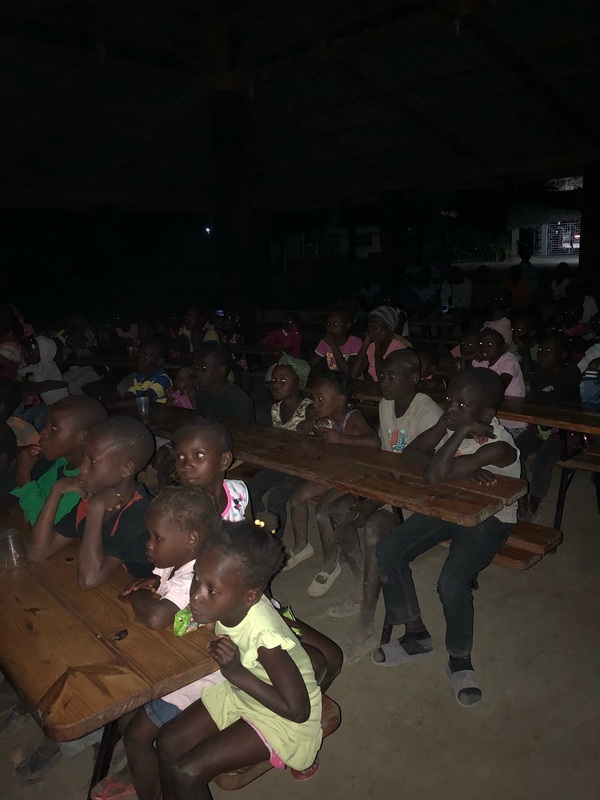 We invited the children that lived nearby to come and watch “Tarzan”. It was really fun to watch the movie with all the kids, even though it was in French and I hardly understood any of it. Sunday we got to sleep in till 8:00 am and went to a local church near our campus. It was a different environment and again I didn’t understand anything that was being said. It was sweet to experience their culture and to see how they worship first hand. I did my best to follow along with the songs and Lucia even complimented me on my singing abilities. After church, we had a family-style lunch at a restaurant in Pignon. Quick sidebar, all of the meals here have been leaps and bounds better than what I have been eating back in Ames at my fraternity. After lunch, we had plans to distribute rice, beans, and oil to some children and their families that had been sponsored. 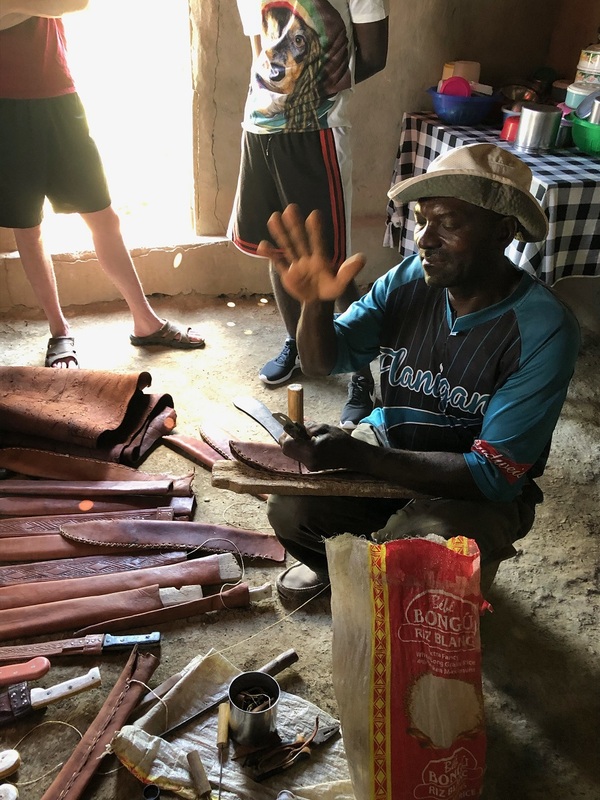 One family we gave food to the father makes leather sheaths for knives and machetes and did everything by hand. We felt a lot of respect for him because it is a hard trade to work in. Another family the father was a beekeeper. 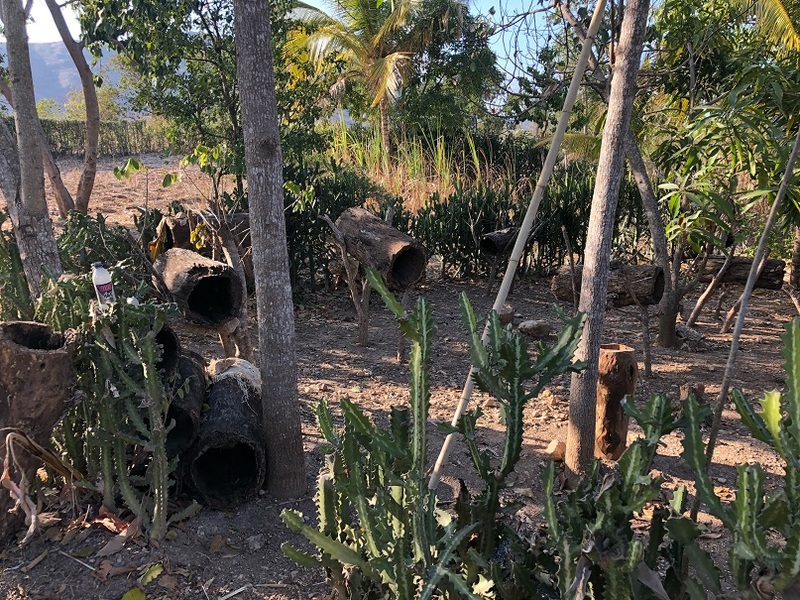 This was actually really cool to see because he had, another sidebar is everyone uses cacti as their fences, cactus fences around hollowed out logs. 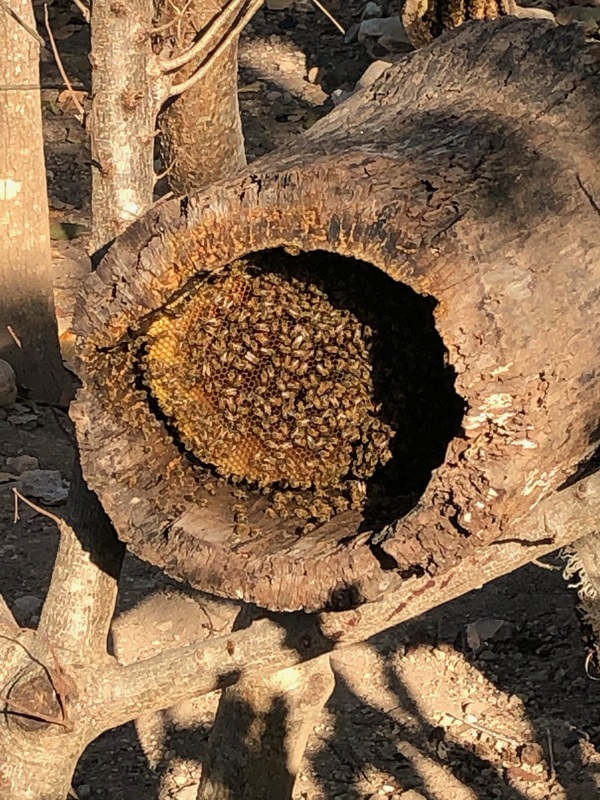 Inside the logs are where the bees make honey. You will be able to see it better in the pictures. 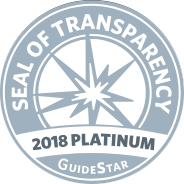 So that is just a quick look at what we have been doing this week. We have plans to do blogs the rest of the week so be on the lookout for that. To close I want to say that everyone is doing great and having a greater time. Jack, Noah and my Creole is getting a little better and I think we now know about six phrases/sayings. Everyone sends their love and we are excited to see what the rest of the week has in store for us. See you all soon.